“Let the wild rumpus begin!” wrote Maurice Sendak in his beloved book, Where The Wild Things Are. That was us on our quick overnight to Galena, Illinois. Galena, Illinois is not someplace most people would call a “destination,” but we are not most people. We love what we love. Galena is a very quaint 1800s river town, known mostly for General/President Ulysses S. Grant’s home. We didn’t bother with that. The town is only three miles from the mighty Mississippi River, and was once a thriving city known for mining lead. That all changed, and now it is a very unique shopping experience. We arrived in the fog. It was a white-knuckle entrance into our time-share condo, compliments of Sister #1. Sister #2, the blind one, did a valiant job of driving us, and after tossing our stuff in the room, we ventured into town where we celebrated with high fives, whooping and dancing about, and Bloody Marys before we walked up the street planning our strategy for the next morning. The floodgates opened, figuratively and literally, and we began our pillage of the town with hot sauce samplings and coffee. As the shops opened,we did a goodly amount of damage. We plowed through the town, shop after shop, trip after trip to the car to leave our packages, hour after hour. Several stops were made for wine-tastings. After overhearing me comment that we had already eaten lunch, a wine-counter lady asked, “Where did you eat?” I replied, “Here. We just had oyster crackers and wine.” Obviously. A lot of laughing, looking, advising, and spending later, with the car loaded, we were patting ourselves on the back for a job well-done. One of my “life’s desires,” five years ago, was a sister road trip. We have made several, now. They just get better and better. Ah, life is…well…you know. Merry Christmas! Well, I guess it is official. I seemed to have relinquished my mid-western and south-western selves, and I have gone full-bore southern. I had grits for breakfast this morning, y’all. Not just any grits. Not the Quaker grits of any type—quick or otherwise. 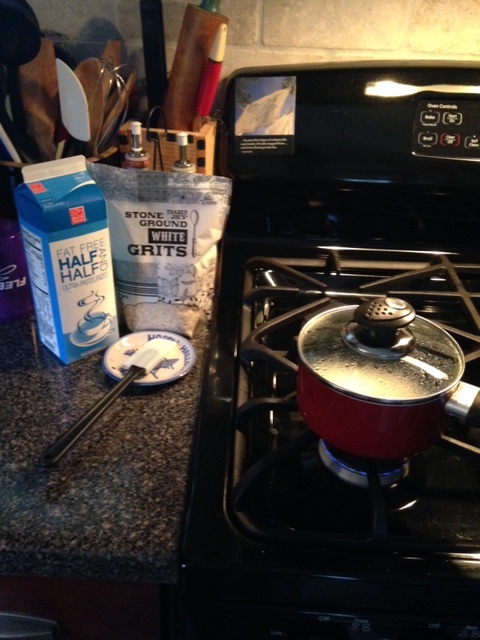 I fixed Trader Joe’s Stone Ground White Grits in the beautifully decorated black and white package. As promised by T.J.’s, they were worth the 25 minute cook-time wait. I am not a good waiter. I pace. I read. I check the weather. I check my email. I even take photos. Sometimes it gets really drastic, and I clean. This morning, I did all of the above while I waited for my grits to cook, and I wondered why I wanted grits for breakfast. I wondered why I even bought these grits. The first time I ate grits, I was 16 years old. I was on the road trip which relocated us from Indiana to North Carolina with my mom, step-dad, and little brother. We spent the night in West Virginia, and had breakfast in a small mountainside café. In those days, any southern restaurant meal would come with grits as a side dish no matter the time of day or the type of food. I thought about this as I fussed and waited for this slow cooking porridge. We have had much needed rain for the past five days. It is pretty dreary looking outside. It is autumn. I guess I just wanted some comfort food, and the good kind. Some people put sugar on their grits, but I can’t bring myself to do that. I just had a hot, creamy serving topped with butter and salt and pepper. 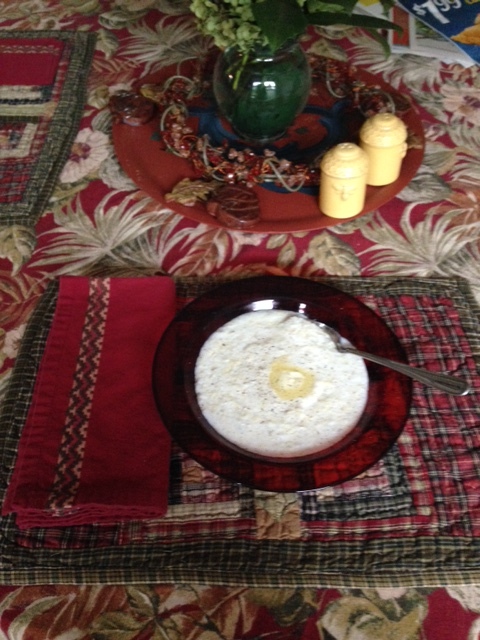 I won’t be waiting for grits too often, but I am glad I did this morning. My two Wisconsin sisters came to whisk me back to Wisconsin. They drove hundreds of miles over two days, battling holiday traffic, to spend the weekend in North Carolina. Their usually fourteen hour trip was extended by three hours of the freeway-parking lot experience, and it was all to bring me “home” to the farm for the summer. Isn’t that a gift? When I first reconfigured my life, I made a list. I didn’t want to call it a “bucket list,” because I was living not dying, so I called it my “life’s desires.” The list was made four years ago, and I have accomplished quite a few things on the list. I made a pilgrimage, landscaped a yard, wrote a blog, and made a road trip with my sisters. Actually, I have made a few of them now. I have written about my three sisters. Two of us have the same mother, and three of us have the same father. I am in the intersecting oval of the Venn diagram. I am significantly older, from twelve to eighteen years older, than the other girls. We didn’t grow up together, but we are fast adult friends, all of us. This past weekend was the second time in my life that all of my sisters were together with me. We had a great time doing two of the things we all love to do, shop for a bargain and laugh. It was wonderful. Then our baby sister stayed home to take care of kitties, and we three Remleys drove north, phoning the baby frequently to keep her apprised of our whereabouts. Our road trips haven’t had the excitement or activity of the ones in the movies. We don’t dally much, and our stops are at restrooms and fast food places, rather than bars or places of interest. We use that time to get ourselves, our family, and the world all straightened out, and to laugh a lot at silly things. We use it to make up for lost time. Perfect.